We escaped to Vail last weekend, and we are so glad we did–the fall colors were beautiful, the weather was great, and we ate one of the best meals we’ve had in Colorado! 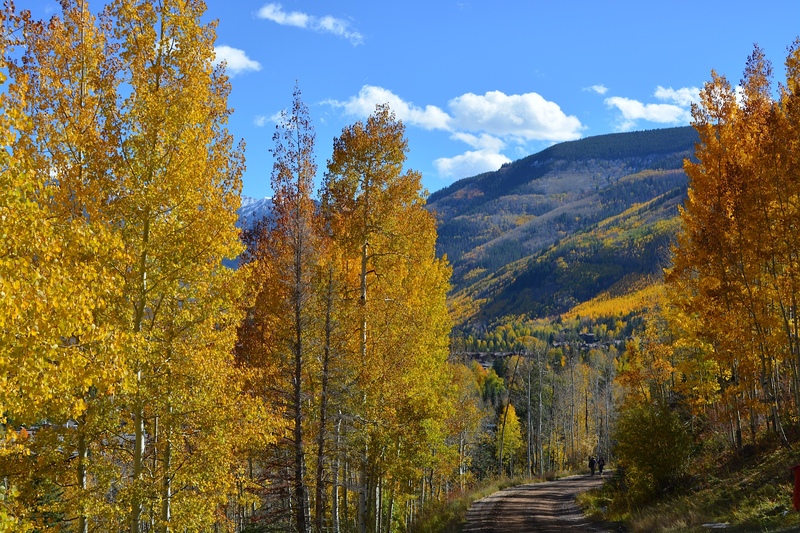 Our drive up to the mountains on Saturday was beautiful–but it wasn’t until we got into the heart of Vail Valley that the fall colors became jaw dropping. We dropped off our bags at our condo and couldn’t resist getting out for an afternoon walk through Vail Village and alongside the creek at the base of the mountain. It was wonderful. We loved that at this time of year there were people there, but it wasn’t crowded–nothing like the peak of winter. Brisk, but not too cold, the weather was perfect for the time of year, and the scenery was gorgeous. That night we had a tasty meal at Mountain Standard, a newer restaurant in the Village. It was quite tasty and worth a visit. But this meal, through no fault of its own, got overshadowed by our dinner on Sunday night, which I’ll get to in a bit. On Sunday morning we went for a hike up Vail Mountain. It was a clear blue sky day, and the temperature was again, a perfect 42 degrees with the sun and our hike keeping us plenty warm. The dirt on the trail started out relatively firm, but a third of the way up the mountain it started getting pretty muddy. Two thirds of the way up, the mud was pretty thick, and pretty soon we were hiking in an inch or two of snow. It was worth it, though! The views were spectacular, and we felt like we had the whole mountain to ourselves, save for a couple brave mountain bikers who didn’t seem to mind the mud. During the summer, the gondola runs and can take people down for free once they get to the top. This time of year, though, the gondola wasn’t running (which probably contributed to the lack of other hikers, for which we were grateful). We made our way back down, and took a few shortcuts by sprinting full-speed down grassy ski runs, pausing briefly to try and befriend a lone deer near the edge of the woods. We got down to the bottom muddy and sweaty, but elated after an awesome hike. We did a little shopping then headed back to our condo where we rested, bathed, and got ready for dinner. We had made a reservation at La Tour, a French restaurant in the village; little did we know that this would be one of the best meals we’ve had in all of Colorado. For starters, the bread and (salted) butter was great. We also ordered the toasted goat cheese (served in tomato sauce) and the truffled French onion soup (beef short rib, garlic croutons, grantineed truffle cheese) to start, and both were delicious. Then came the entrées. My wife Jessa got the sweet potato truffle agnolotti, an exceptional ravioli-like pasta with parsnips, carrots, cippolini onions, and mushroom brown butter. I got the Colorado lamb trio, which featured a braised shoulder & ricotta ravioli, lamb bacon, lamb meatball, exotic mushrooms, watercress, and parmesan broth. It was dynamite! For dessert, we ordered the PB & J. This, of course, wasn’t a standard PB & J sandwich; it was a plate of peanut butter mousse, wafers, peanut brittle, concord grape sorbet, jelly, and toasted peanuts. TO DIE FOR! If you’ve got the time and ability to get out to Vail in the next week or so, make the trip so that you can see the fall colors, eat some fantastic food, and enjoy it all…without the crowds.